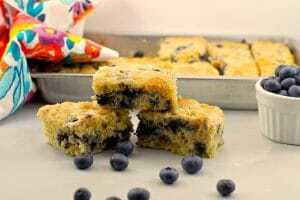 If you are looking for something quick to make ahead and throw in the kids lunch box for a morning snack/breakfast or dessert, this blueberry cornbread recipe is the one for you. Cornbread is elevated to an entirely new level with frozen blueberries and lemon zest added to the batter! Blueberry Cornbread is so versatile! 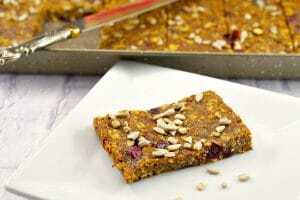 This is one of my favorite dessert/snack/breakfast recipes, so much so that I hardly changed it from the original. I use frozen blueberries because I always have frozen blueberries on hand, I don’t have to worry about them going bad and frozen fruits are a great way to save money (especially in baking.) I don’t even notice a difference between the fresh and the frozen blueberries. You can simply do a straight substitution. We are up and out the door relatively early and my kids don’t always want to eat breakfast. I am in love with this cornbread recipe not only because it’s portable, but it’s something that they can eat at any point in the morning for a breakfast, snack, on the way to the bus or a dessert at lunch. It’s also quick, easy, you can make it ahead, freeze it and then throw it in the lunch bag the night before. 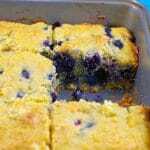 Weight Watchers Friendly Blueberry Cornbread! 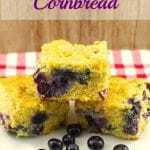 If you are looking for a lighter version of Blueberry Cornbread, give my Weight Watcher’s Friendly Healthy & Light Blueberry Cornbread a try! I reduced the freestyle smart points from 9 to 5 and my kids said they actually liked the lighter version better! 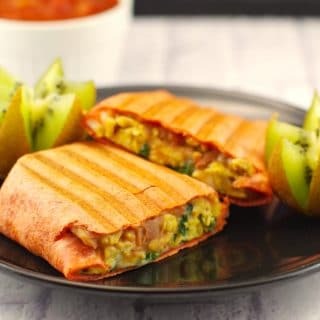 YOU MAY ALSO LIKE THIS LUNCH BOX SNACK! 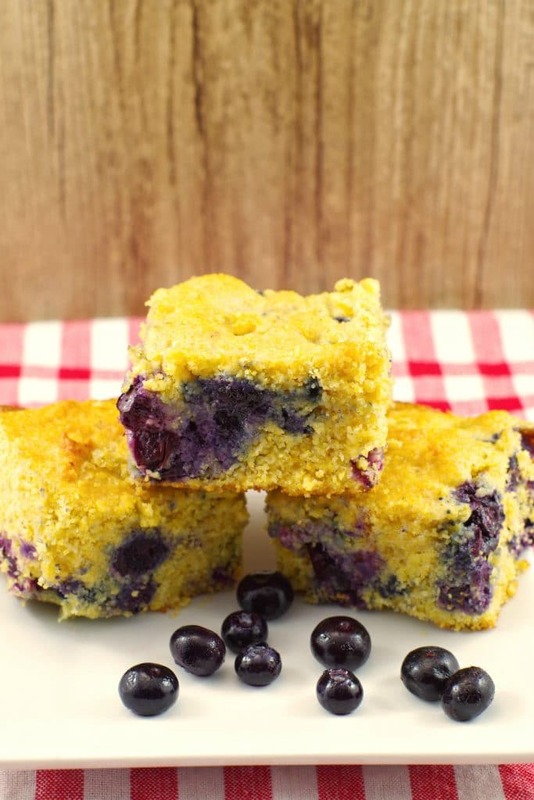 Cornbread is elevated to an entirely new level by adding frozen blueberries and lemon zest to the batter ! It's great for the kids' (or adults) lunch box for a morning snack/breakfast or dessert! Preheat oven to 400° and spray an 8-inch square baking pan or a cake pan with non- stick cooking spray. Toss blueberries with 1 tbsp of flour and set aside. Combine flour, cornmeal, sugar, baking powder, and lemon zest in a large bowl. Stir with a whisk to evenly combine ingredients. In a medium bowl, whisk egg, milk, vegetable oil, and vanilla extract. Add wet ingredients to dry and mix just until dry ingredients are moistened. Gently fold in blueberries. 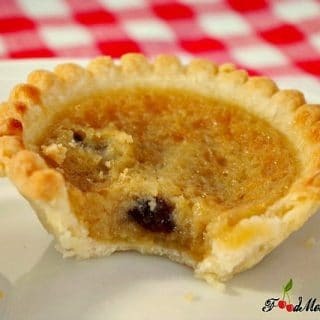 Pour batter into prepared pan and bake for 20-25 minutes or until a cake tester or toothpick inserted in the center comes out clean. Cool for at least 10 minutes before cutting. Serve warm or cold. 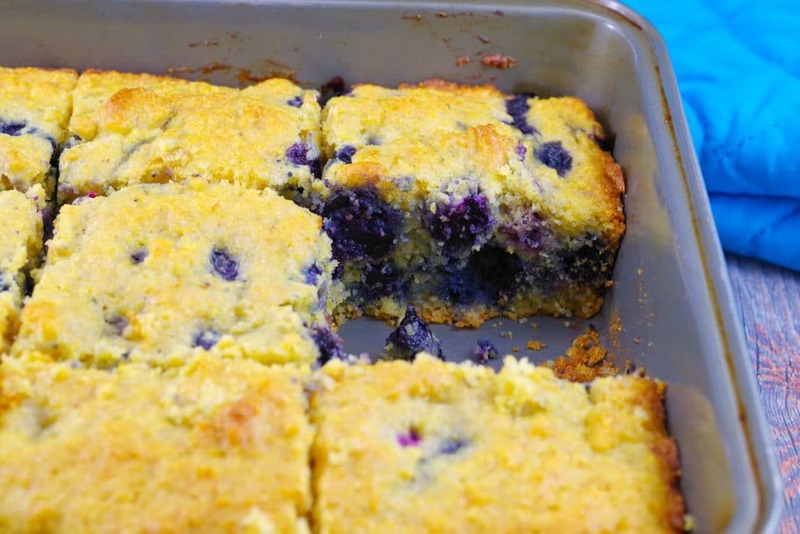 I never would have thought about pairing blueberries with cornbread, but this looks and sounds so good!